Appalachia and the Appalachian Mountains host some of the most interesting ecology and geology in the United States. Here I highlight five awesome things I hope to find/see/take a photo of during my AT thru-hike. 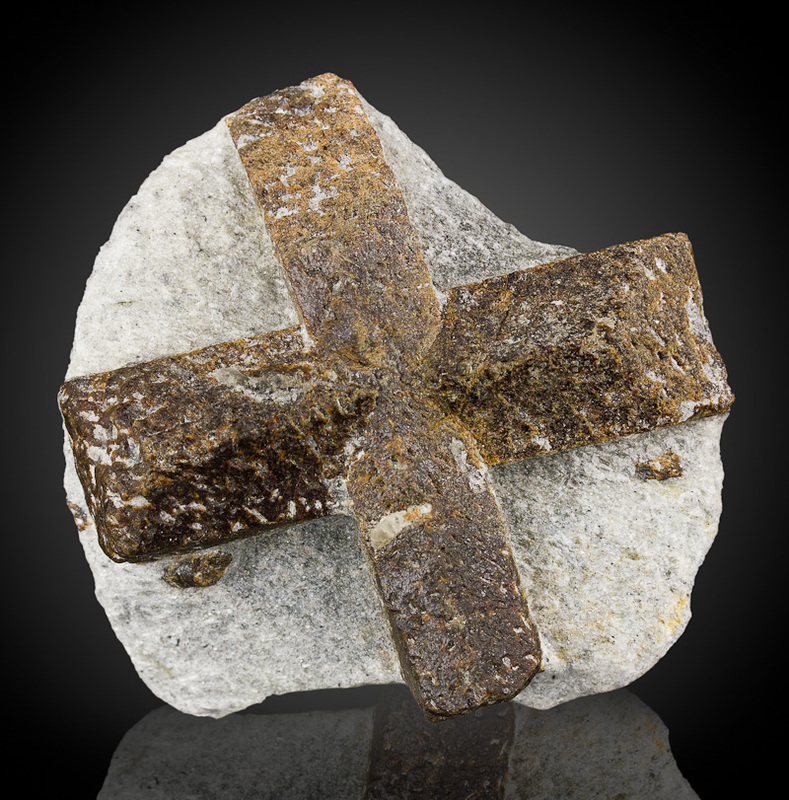 The Fairy Stone, Fairy Cross, or staurolite crystal is the state stone of Georgia and so named due to the cruciate deposition of a darker mineral within a lighter, surrounding stone that resembles an X or a cross. Prevalent in northern Georgia as well as some parts of Virginia, these stones are often collected by gem hunters. This website claims that “staurolite is a tool for communicating with animals and other entities of the natural and fairy realm.” So I’d like to get my Dr. Doolittle on with the animals and fairies. A wild cousin of your grocery store leek or onion, ramps are most prevalent in the southern Appalachians in the early spring (April in Georgia and North Carolina, for instance). When I lived in Raleigh and Chapel Hill, NC, the farmers markets would explode with ramps early in the growing season. These delicious plants can be used at home as an alternative, more delicate onion. Recipe recommendation: toss them on your pizza when it has five to ten minutes left in the oven and they’ll wilt perfectly and just start to singe. Backcountry cooking tip: clean them with filtered water and toss them into anything for an extra greens. Similar to leeks and onions, they’re high in vitamin K, which is important for blood clotting and bone health. The largest amphibian in the united states, the hellbender salamander is also known as the snot otter, devil dog, and Allegheny alligator. Growing up to 12 to 15 inches in length, the mostly nocturnal hellbender hunt for crayfish, toads, and other, lesser salamanders among other tasty options. SOBO hikers may have the best chance at spotting the hellbender in late August or early- to mid-September during the amphibian’s breeding season. This is one of the few times the hellbender is likely to venture out from its normal hiding area. Only found at Grandfather Mountain, Mount Mitchell, and Roan Mountain State Park, the spruce-fir moss spider is the smallest tarantula in the United States and, as of yet, discovered in the world. Adults measure 3 to 4 mm (about 1/8 inch) when fully grown and take one to three years to reach this size. These animals have been on the endangered species list since 1995–mostly due to habitat destruction. As their name implies, the spruce-fir moss spider lives on moss under spruce and fir trees. Bonus fact: spruce and fir trees shed their needles on purpose in order to acidify the ground around them. This aids the germination of their seeds while also choking out other plant life from competing for nutrients. The northern flying squirrel is a nocturnal rodent with notably large eyes and a long flattened tail that makes up 80 percent of its ten- to 12-inch body length. They generally live in elevation areas that exceed 4,500 feet, and prefer the spruce fir forest transition zones that border northern hardwood forests. Additionally, unlike me, they tend to prefer colder climes with a geographic distribution that favors the northern section of the AT as well as into most of Canada and parts of Alaska. 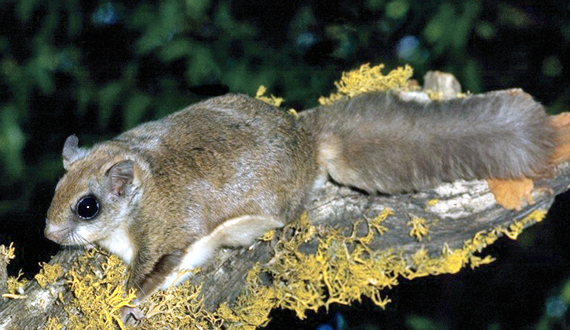 Flying squirrels nest in tree cavities and use lichen, dried grass, and finely shredded bark to line their nests. They have a slightly smaller cousin–the southern flying squirrel, which grows to about eight inches in length and, as the name implies, lives within the southern Appalachian Mountains.